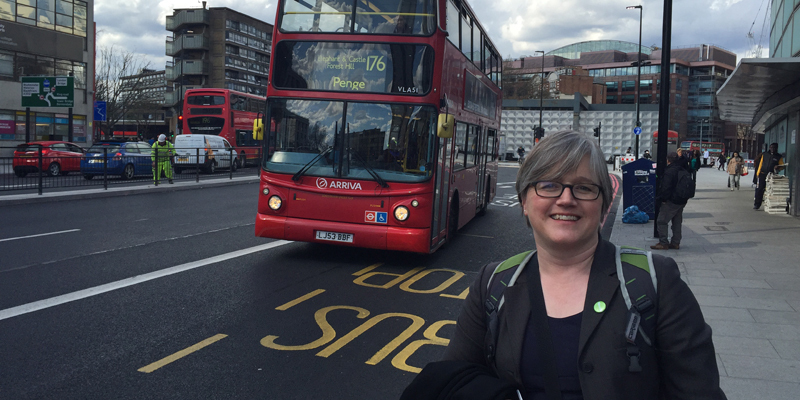 Assembly candidate Caroline Russell writes about her findings from a bike tour of London. Over the past few weeks I’ve been out and about to meet Londoners and learn what it’s like to walk and cycle in their neighbourhood. The London Mayor and Assembly elections are just a week away now and streets and cycling are hot topics. But the majority of the capital is still an overwhelmingly hostile place for people who want to get around on bike or on foot. The Olympic Park could have been designed with people friendly infrastructure that did not assume the default transport was by car. Rather we got huge car parks, roads where it is unclear where you should be on a bike and horrible muddled shared surface pavements that are miserable for people on bikes and on foot. Car-dominated fast flowing noisy polluted roads predominate and the school drop-off was all about cars not walking and cycling. With every passing day there are more Olympic Park stakeholders to negotiate with over any change and the missed opportunity becomes more apparent. There is clearly much work to be done to make London’s streets more inviting. But by electing Greens like Sian Berry and me to the London Assembly on 5th May, you can make sure there is someone standing up for walking and cycling in City Hall over the next four years. 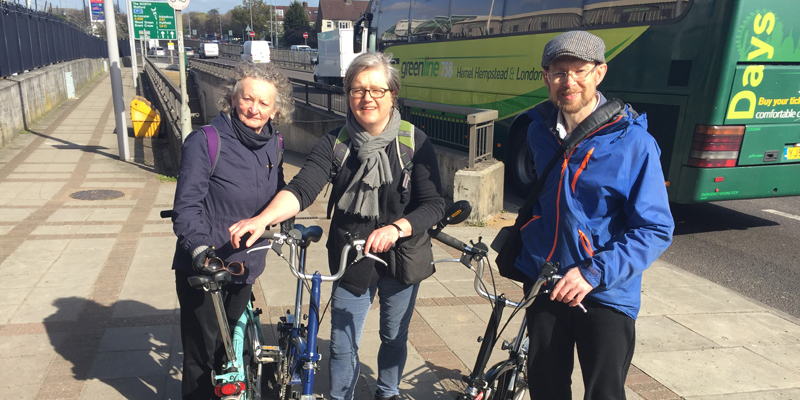 Jenny Jones, pictured on the left above with me at Brent Cross, and her Green colleague Darren Johnson got Transport for London to do the research needed to get London’s cycle superhighways, Mini Hollands and cycle hire projects off the ground. They fought cuts to the cycling budget and argued successfully for more money for cycling. As a longtime walking and cycling advocate, I understand how well-designed, people friendly streets should work for everyone whether they are young, old, blind, sighted or mobility impaired. Londoners deserve inclusive streets that prioritise people over fossil-fuelled vehicles and provide safe convenient space for everyone to get around. More trips made by bike and on foot will benefit all Londoners not just those that currently ride bikes. If London is going to really gain from a cycling revolution then all Londoners need to see how that will benefit them and that means making sure that bike lanes are designed to work for everyone without pitching pedestrians against cyclists. So what would I do for cycling in London if I’m elected to the London Assembly? London’s cycle campaigners have years of experience of riding the capital’s roads. They know what needs to be done to make the roads safer and create a network of routes, but all too often TfL are making the wrong choices. At Camberwell Green junction there is a once-in-a-generation chance to overhaul a vehicle-dominated swathe of south London. TfL and Southwark Council have failed to draw on the expertise of local cycling and walking groups and risk missing all the possible benefits because TfL doesn’t want to reallocate road space claiming it risks causing delay to vehicles. Likewise at Elephant and Castle a huge redesign has still got a “highway” passing through designed for 30mph speed, not 20mph as it should be, and with central barriers preventing pedestrians reaching the buses on the other side of the road. I am committed to reinstating the road user hierarchy putting the needs of pedestrians and cyclists first and would bring campaigners and local residents into City Hall to meet with TfL’s engineers, suggest improvements to inadequate schemes and make streets that work for all Londoners not just those in motorised vehicles. Communities must be at the centre of the plans for area-wide schemes such as the Mini Hollands and they must be designed for area improvement not simply as cycling schemes. That way the whole community may understand what is in it for them and engage with getting the design as good as possible for everyone. 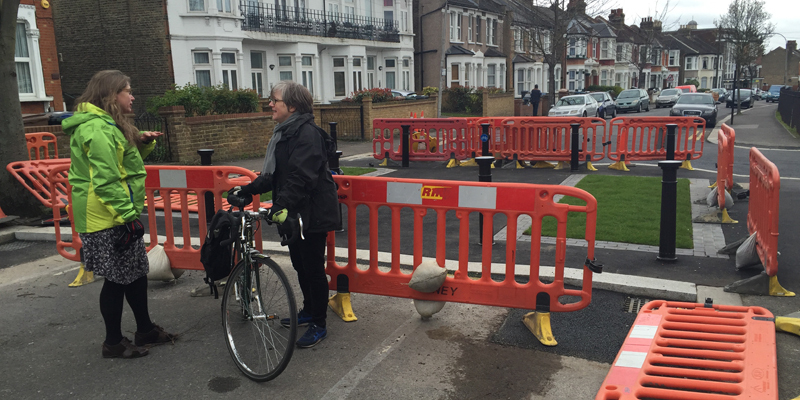 On recent visits to Walthamstow I’ve heard from residents who love the new public corners being created by filtering side streets and who enjoy hearing birdsong near their homes since rat-running traffic has been removed from their street. 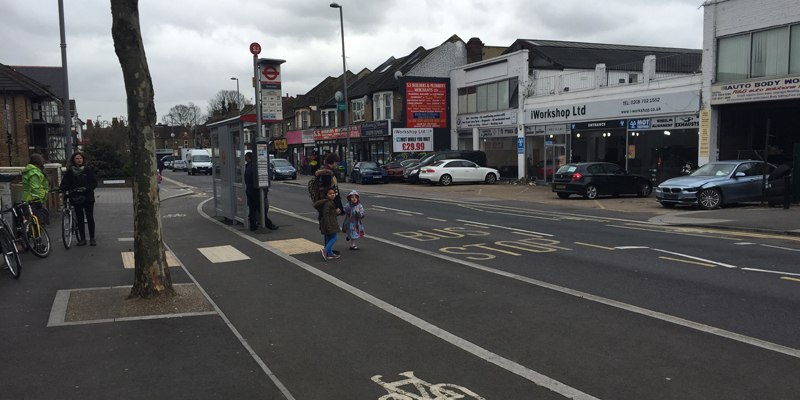 The Walthamstow Mini Holland shows the potential for improving main roads across our city with Copenhagen crossings that give pedestrians a continuous right of way across side roads. 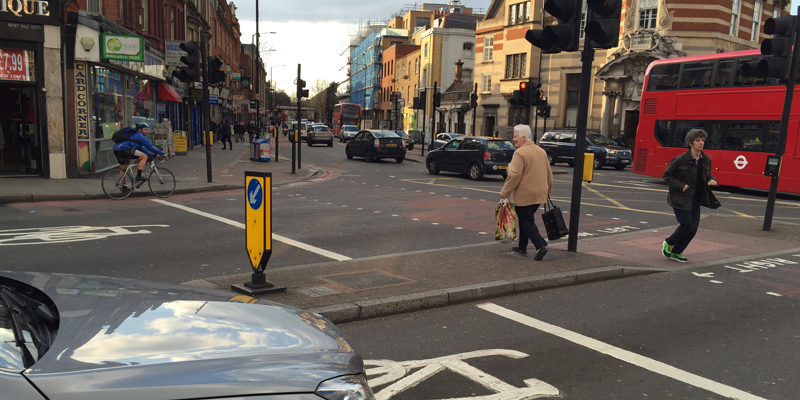 These crossings emphasise rule 170 of the Highway Code and encourage car drivers to give way to pedestrians. Copenhagen crossings work best combined with filtering of side roads to reduce traffic flows and cut out any rat-running journeys. This is increasingly important as sat nav and apps like Waze give every driver passing through an area the knowledge to cut through on side streets. If we are keeping the side roads free of through traffic then the main roads need particular attention to make them less traffic dominated and more pleasant for the many people who live above the shops. This means using lots of design tools: Copenhagen crossings, filtered side roads, protected bike tracks, 20mph speed limits and new pedestrian crossings where people need to cross the road. I met some people unhappy about elements of the Mini Holland design. One woman described feeling stranded on a narrow island with her toddlers waiting for the bus between fast flowing motor traffic and speedy bikes. Well designed bus stop by-passes make streets better for cycling and are safe and convenient for people on foot there are some great examples on CS6 on Blackfriars Road. However I can see why people with small children and disabled people are wary of some bus stop bypass design implementation. The other issue that came up was the way people had been asked for their views on changes to their local area. 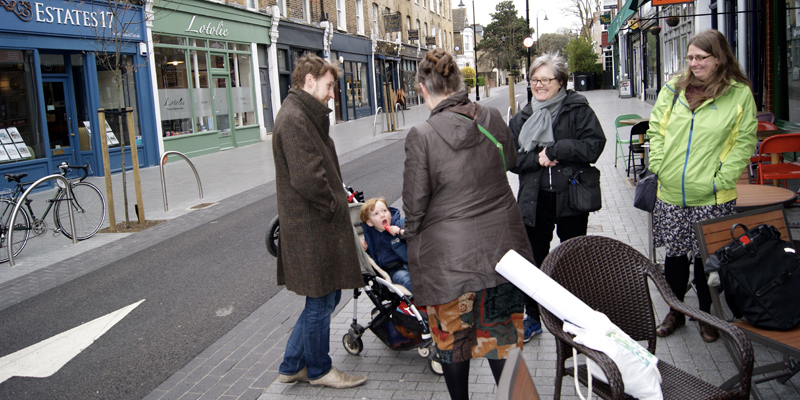 Greens would put Mini Holland levels of investment into every borough so that we can sort out London’s congestion, public transport capacity and pollution crises but TfL must get better at explaining the benefits to communities and at making sure local people are fully involved in redesigning their neighbourhoods as people-friendly places. The capital’s cycling budget is set to fall off a cliff – from £166m in 2016/17 to just £68m in 2020/21. That means there won’t be enough money to pay for the planned superhighways or the fledging quietways. The need for these is acute. 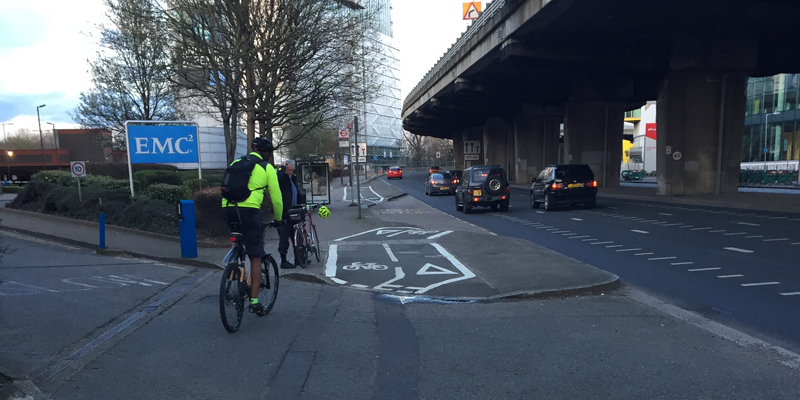 I visited Hounslow recently, where the stalled Cycle Superhighway 9 should be providing a safe route to Heathrow and to central London while connecting the town centres in Brentford, Chiswick and Hounslow. We cycled around in the shadow of enormous multi-lane roads where there is patchy provision for cycling which in many places dissolves to leave no obvious place for cyclists to be on the road at all. Side turnings off the main roads providing particular dangers from fast-flowing left-turning vehicles. With a Green Mayor we’ll keep this funding going, and on the Assembly we’ll will fight for a bigger share of London’s transport budget to be allocated to cycling so that projects like CS9 can go ahead. I will make sure TfL properly explains how successful the first superhighways have been so that the benefits of investing in more are plain to see. Outer London is the key to the capital’s cycling revolution – almost two thirds of all London trips that could be cycled are made by residents of the car-dependent outer boroughs. However, Boris Johnson spent just a fifth of London’s cycling budget in the suburbs. Conditions for cyclists are dire, as I found when I visited Barnet and Brent cyclists last week. Jenny Jones and I were advised there was almost no point in bringing our bikes as there was almost nowhere safe to cycle! We saw fast-flowing highways with two storey houses perched alongside and with side streets used as rat runs, by those in the know, to avoid hold ups at traffic lights. Getting to the shops on the other side of the road means navigating a major underpass or getting in a car and driving round. 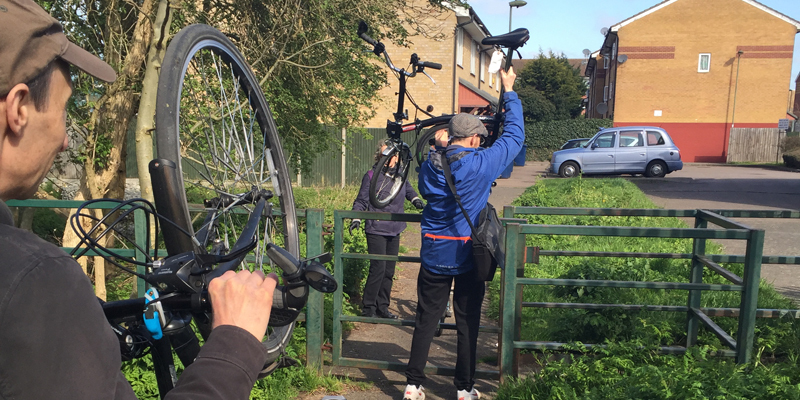 Away from the main roads we cycled along a path through a green space with allotments on one side – a breath of fresh air but disrupted by the presence of kissing gates that involved lifting bikes to get past. Luckily none of us had a cargo bike or trailer as it would have been impassable. It’s little surprise so many get in the car as the alternative is noisy, dangerous and polluted. Taking some of that road-space to make decent provision for cycling so that local journeys by bike are a real alternative would be transformatory for the communities divided by roads like the north circular. 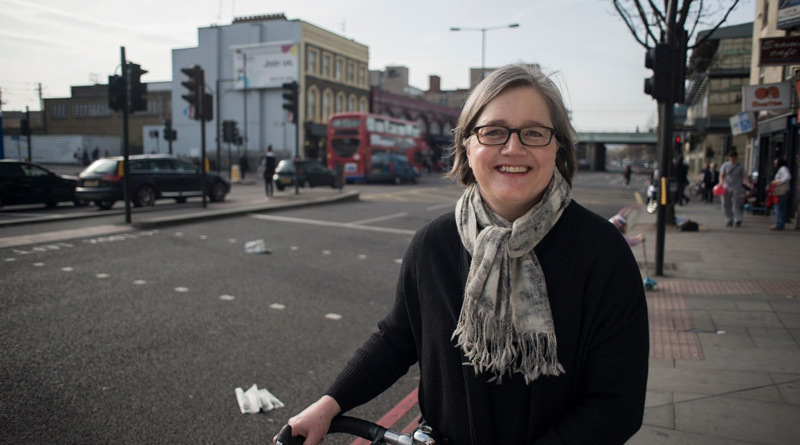 I would press the Mayor to get on with rolling out big-ticket cycling projects connecting every London borough with a convenient network of routes so that cycling isn’t just safe and appealing for those who happen to live or work in inner or central London. The main impression from my cycling tour has been that Londoners need serious champions for cycling in City Hall. With the two ‘leading’ candidates for Mayor demonstrating no real passion for cycling and even threatening to rip up schemes if they deem them not to be working. The sense of momentum that has started to build behind cycling in London, with decent infrastructure where people on bikes have their place on the road, could be stopped in its tracks very suddenly. We can’t take it for granted that cycling will continue to get easier and safer in London over the next few years. There are plenty of people who don’t yet see an alternative to using road space primarily for motorised vehicles. Greens at City Hall will use our real understanding of the importance of walking and cycling to shape TfL’s decisions about the design of London’s streets. That’s why I hope that as well as voting first choice for Sian Berry as Mayor, that you will vote Green on the orange ballot paper which elects London Assembly members by proportional representation and is the way Londoners have elected Greens like Jenny Jones and Darren Johnson to City Hall over the last sixteen years.